Add visual interest and rustic charm to your dining area with this pair of Eleanor chairs from iNPSIRE Q. The classic rubberwood frames feature contoured seats and farmhouse-inspired X-shaped seat backs to complement your shabby-chic aesthetic. Pick from seven antique-finished colors to pair perfectly with your decor. We needed 6 kitchen chairs. 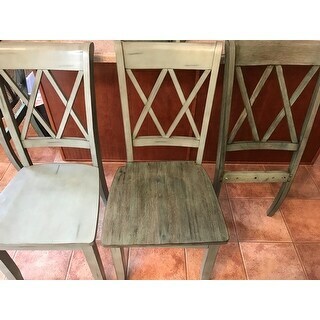 I decided to buy three sets of wooden iNSPIRE Q Classic chairs in different styles but the same antique dark denim color. Some of the styles were 36" tall and some were 33" tall, and they looked funny next to each other, so I ended up buying three of the tall styles and sending the short ones back. (Eleanor double X back is a tall one.) They were not bad to assemble but a couple of them are quite wobbly. We haven't tried to correct this yet. They are pretty comfortable. The finish is attractive, a mixture of black and navy. Some of them were dinged up right out of the box, but they are dark enough to fix with a black marker. Overall we are satisfied with them. I ordered the black chairs, and I love them. They are black, but there is brown wood showing through--a sort of worn, distressed look. I love them. They are very comfortable to sit in, too. Plus, they seem quite sturdy. My husband said they were easy to put the together. However, a wrong-sized screw was sent in one of the boxes, but luckily my husband had the right size on hand. I can't believe what a great deal I got on these chairs. 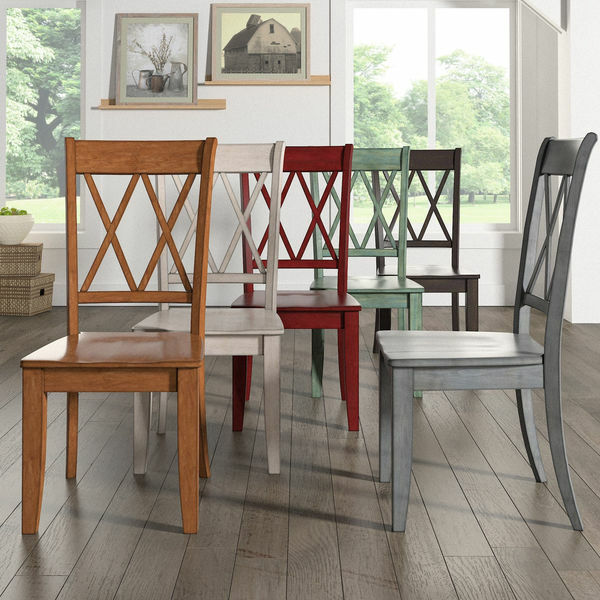 I got 4 of these chairs in the sage finish to go along with the Eleanor Two-tone Round Solid Wood Top Dining Table by iNSPIRE Q Classic. I am in love!! The chairs are very sturdy and durable! Very happy with this purchase! I purchased 6 chairs total in the Antique Sage color. These are good, heavy, solid, quality chairs. The color is beautiful and they sit very comfortably with an extra-wide seat. Everyone in the house loves them! I gave them 4 stars instead of 5 only because I had difficulty in attaching the seats, but I bought 1-1/4 inch wood screws to replace the 1 inch screws provided, and that worked. Just be careful, if you do that, not to push too hard with the cordless drill when screwing the frame to the seat. I called Customer Service after I broke through the seat, and Rosie was kind, helpful, commiserating, and funny. She made it right for me. This is my first purchase with Overstock, and I know that I will come here again and again with this quality and service! Exactly as pictured ..... very happy with the product. My BF put together in no time. Sturdy. I love these Double X Back chairs! They were easy to put together and look great with my hand painted table. They are super sturdy and stylish. These chairs are very sturdy and heavy. 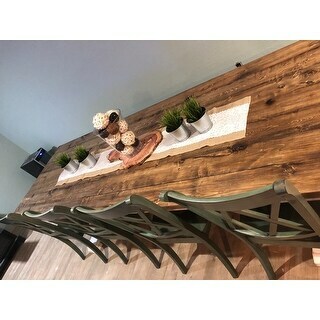 The finish is beautiful and fits perfect with our farmhouse table. They were easy to put together and arrived in perfect condition. I absolutely would recommend these chairs. Very easy to assemble and the quality is excellent, not a ding, crack or flaw. Beautiful color! I'm very impressed and happy we chose the Eleanor Double X back chairs. Love these chairs. No discomfort on spine with Double X back. Denim color is perfect for my color scheme. I ordered sage Green color chairs. But real color is little bit more dark than picture. So I want to match my old chair. Seem like not matching. Pictures do not do these chairs justice. They are even more beautiful in person. They have just the right amount of stressing to them and the gray color coming through the white is so pretty. My husband said they were easy to put together and are not cheap made are very sturdy. I absolutely love them paired with my distressed gray table! These chairs are very pretty and appear that they might be sturdy - however I have not been able to use them as the seats are not yet assembled. The instructions said to use a screwdriver to fasten the seat with little screws - but there are NO screw holes in the seats! A drill is necessary and I'm not certain that the little screws provided will even be long enough. Also there are no marks on the seat where screws should go - so it will be a challenge to ever assemble these chairs. Disappointed. I didn’t realize the color was not totally black. Instead it has a kind of distressed look. It’s fine but I wish I would have known beforehand. 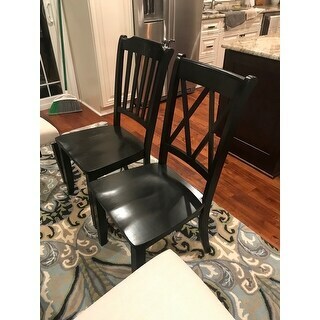 Also the chairs come as a pair and I received one that was black but a totally different chair than the one I ordered which they said I have to send back. They are sending a replacement but my husband had already put the chairs together. Now I have to disassemble the wrong chair put it back in the package when they send the replacement. And send two of them back. They could have just sent 1 chair to me and been done. Kind of crazy. El diseño es muy elegante, el color super hermoso es de muy buena calidad. These chairs look great. When putting together, one chair was slightly off to get a good tight fit for the seat part. 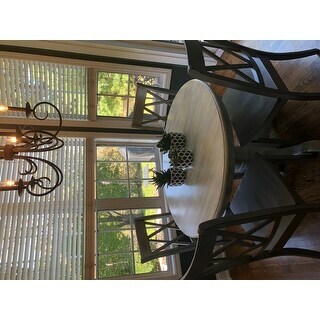 We purchased 8 of the gray chairs for our new dining table. We love the look and they are very sturdy. We had an assembly issue with one chair but the company was great to work with us and come to a solution so we could fix and keep the chair! Love the chairs. Great seating and the color is perfect. Easy to put together as long as you read the instructions. Very sturdy, great quality for the price. Messed up putting the first one together but after that the rest were easy. Nice muted black color. These sturdy chairs look even better than I thought they would and they are very comfortable! I love these chairs! They look great with my table and are so sturdy. I think I would like them better with cushions but they look great without too! Great chairs. Just as pictured and sturdy. Would recommend. 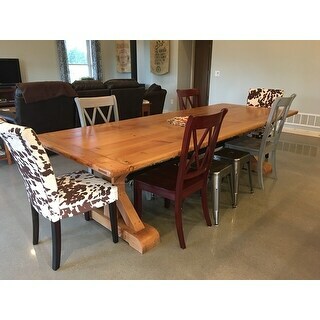 Purchased the white ones and they look great with my round farm table. They look nice and are pretty comfortable too. "Do you sell cushions that fit these chairs?" "Will the red chairs come back in stock soon?" These are expected to be back in stock by the middle of March. "How much does each chair weigh? " Each chair weighs approximately 22 pounds. "When will the vintage denim color chairs be back in stock?" The dark denim is estimated to be back in stock in January 2019. "Would the antique white match with the benchwrite x table antique white?" That would be based on your preference. The antique white is a darker white than true white. "Can these be commercial use? " "When will the antique white be back in stock ?" The antique white option is expected to be back in stock in November.